Add whimsical fun to your child's Play Set when you install this Swing-N-Slide Summit Slide. It arrives in 2 pieces for easy and cost effective shipping and is easily assembled using included hardware. The Summit Slide features a comfortable scoop design with wide handrails that attaches to any four foot deck height. The durable, fade-resistant polyethylene construction is built to last and can support up to 250 lbs. 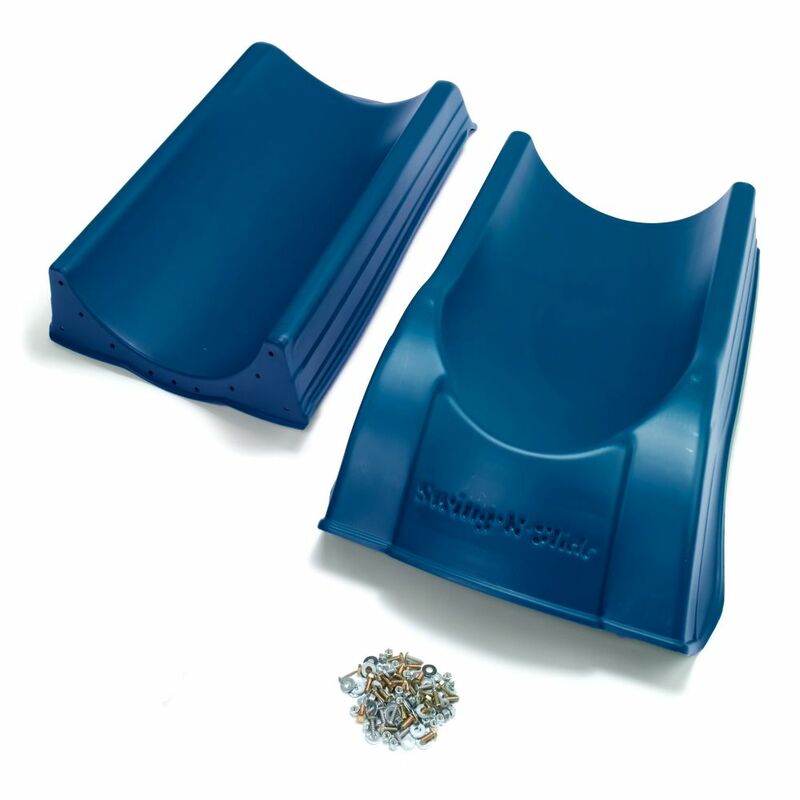 Swing-N-Slide<sup>.</sup> warrants its thermoformed slides and climbing mountains to be free from defects in workmanship and materials, under normal use and conditions, for the lifetime of the product. Outdoor playsets from Creative Cedar Designs come ready-to-assemble with everything you need to create the perfect, play-safe swing set experience! Timber Valley swing set features covered, 20 sq. ft. play tower with pitched roof assembly and built-in sandbox below, swings for up to 4 at one time, and a variety of other activities so kids, family and friends can enjoy your backyard swing set together. Whether your child would rather be scaling the rock wall, barreling down the wave slide, reaching new heights on the swing set or simply enjoying the view, the Timber Valley playset is packed with activities to encourage hours of rigorous playtime. Experience the thrill of air hockey right in your own home. The Blue Line 32-in Table Top Air Hockey model is space-saving, lightweight, portable and extremely durable. It features built-in goal boxes and slide scorers. The powerful battery-operated blower provides awesome, fast-paced table action. This tabletop game comes complete with two 2.5-in strikers and two 2-in pucks. 180-day Limited warranty. Introducing the all new Orbiter Swing Set that combines the Strength of Wood with durability of plastic. Made from low maintenance wood guard with UV protected plastic encapsulation, this swing set is heavier, stronger and more stable than comparable metal swing sets. The swing set includes everything. Wood guard posts, all swinging accessories, hardware and fasteners and fully-illustrated instructions. The Orbiter comes with a 5 year warranty and is adheres to ASTM's guidelines for safety. 2-Piece Summit Slide in Blue Add whimsical fun to your child's Play Set when you install this Swing-N-Slide Summit Slide. It arrives in 2 pieces for easy and cost effective shipping and is easily assembled using included hardware. The Summit Slide features a comfortable scoop design with wide handrails that attaches to any four foot deck height. The durable, fade-resistant polyethylene construction is built to last and can support up to 250 lbs.